We’d love your help. 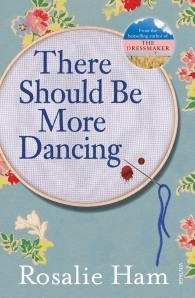 Let us know what’s wrong with this preview of There Should Be More Dancing by Rosalie Ham. Margery Blandon was always a principled woman who found guidance from the wisdom of desktop calendars. She lived quietly in Gold Street, Brunswick for sixty years until events drove her to the 43rd floor of the Tropic Hotel. As she waits for the crowds in the atrium far below to disperse, she contemplates what went wrong. To ask other readers questions about There Should Be More Dancing, please sign up. Sometimes funny, sometimes sad, secrets kept and eventually revealed, dysfunctional families, problems of ageing and trying to keep your independence, ignorance and blinkered to what your actions have done in the past and how it affects people around you, friendships and enemies - it's all here in a somewhat bittersweet book by Rosalie Ham. I really enjoyed it - with the exception of one page concerning some poor mice. This is a great story, I laughed out loud, because some of the things the old lady in the story does, is just like my mum. Easy to read, this story is about an older lady who thinks her whole family is out to get her...are they? If this had not been a book club book, I would not have finished it. A dreary tale that tries to be funny, with a bunch of execrable characters. It goes on and on for abut 350 pages - I thought it would never end. Rosalie Ham does have a quirky style and a good turn of phrase - but.... much more editing needed. My mum recommended this to me as it was her book club book for the month. I think there was a lot in the book which she recognised and enjoyed - the Brunswick setting, the difficulties of aging, not particularly liking your relatives - but which I didn't have much point of reference to. I didn't find myself very interested in any of the characters, nor find their exchanges entertaining. A shame. I enjoyed this but felt that maybe the author was trying to make too many different points about relationships instead of focusing on one main point and doing it well. At one point I nearly gave up on the book all together. The bit I liked the most was the comment, "There's no point living for things we can't have because you don't get the life you could have had." Yes indeed there should be more dancing as people age! It takes remarkable skill to write well about the very old. Constrained by the inevitability of time running out for the character, and limited also by the realities of decline, an author not only has to resist being mawkish or sentimental, but also has to work credibly with how the surrounding characters behave towards the elderly. The fiction I’ve read has revealed a horrid truth: that old age tends to bring out the worst in the people arou Yes indeed there should be more dancing as people age! In Love without Hope, Rodney Hall showed us Mrs Shoddy being patronised by people who should have known better: they carelessly consigned her to a mental hospital with undiagnosed depression. In The Trout Opera, Matthew Condon brought us the exploitation of centenarian Wilfred Lampe by the shallow-minded Sydney Olympic Committee. Both these characters thwart their fate through their own indomitable will but it’s a near thing. Essential to the success of a novel featuring a very old central character is a strong personality, and this is especially so when exploring the fraught territory of family relationships and an unedifying quest for inheritance. Elizabeth Hunter, in Patrick White’s The Eye of the Storm is physically frail but as sharp and malevolent as ever, and in this comic novel There Should Be More Dancing, Rosalie Ham has created an equally memorable character in Margery Blandon, surrounding her with other old ladies ageing along with their houses in the street. Each of these ladies defies easy assumptions and each keeps her secrets close. There is Life of the Party Pat, now losing her marbles but privy to a scandal kept from Margery for a lifetime; quiet Mrs Parsons who signals daily that she’s still alive by raising her blinds but has never shared her personal tragedy with Margery, and Florence (Flossie) who is still ‘a looker’ in her old age despite her booze and ciggies. She plays a pivotal role in the story. Rosalie Ham appeared at the Canberra Writers Festival as part of a morning tea session on my birthday bless her. It's not the first time I've seen her speak on the writers festival circuit and I dare say won't be the last, she's quite entertaining. Rosalie mentioned that she loves writing, growing up she had a cast of thousands of people in her head. And now she's written this, 'There Should Be More Dancing' a novel from the perspective of 79 year old Margery Blandon who lives her life guided by Rosalie Ham appeared at the Canberra Writers Festival as part of a morning tea session on my birthday bless her. It's not the first time I've seen her speak on the writers festival circuit and I dare say won't be the last, she's quite entertaining. Rosalie mentioned that she loves writing, growing up she had a cast of thousands of people in her head. I know there will be many in my age group (seniors) who will wholeheartedly agree with The Australian's comment on the front cover, (Ham's eye for the absurd, the comical and the poignant are highly tuned) but I don't. Having said this, I would give the author 3/10 for her descriptive ability. She has brought the characters and situations to life so perfectly, it was so easy when reading to see them in front of me. A little long perhaps but I think many people will relate to the topic. It is not a book I would ever have chosen to to read or recommend and I found it very depressing that nothing nice or pleasant was ever described. I'm not sure if I should have but I laughed and laughed and laughed at this book. Every page just had me bent double with ridiculous snippets that had me looking around for someone to read it aloud to! It's full of fabulous, crazy characters and ordinary, everyday events that just had me i stitches. It's the story of Marge who has decided to kill herself instead of letting her family put her in an old peoples home. Her family take her to a fancy restaurant for her 80th birthday (its actually only I'm not sure if I should have but I laughed and laughed and laughed at this book. Every page just had me bent double with ridiculous snippets that had me looking around for someone to read it aloud to! It's full of fabulous, crazy characters and ordinary, everyday events that just had me i stitches. It's the story of Marge who has decided to kill herself instead of letting her family put her in an old peoples home. Her family take her to a fancy restaurant for her 80th birthday (its actually only her 79th but she doesn't correct them) and she gets it into her head to jump from the top floor balcony. Her checks herself in for the night and so begins an analysis of her life up to that point. This is the story of an eighty year old woman who has lived her life according to everyone else's rules and expectations. Even when she finds out a whole lot of family secrets, her enlightenment is, in my opinion, still according to the lights of others. The plot is somewhat contrived and much of the plot-line is predictable. The story is sad and depressing but not without flashes of humour. It's not a book to 'love' but it does convey a reality that makes it compulsive reading. Highly recommended – but not if you're looking for a cheerful read! I was really excited when Rosalie released her new novel, I absolutely adored her first two novels. I have to say I was a bit disappointed by this one, it just didn't capture me as I expected. Her character construction is again terrific, with vivid lifelike quirky character traits. I think it was perhaps the age of the main protagonist, which I found difficult to engage with. I felt like I was waiting for something to happen, but with the changing time perspective and switching from first to th I was really excited when Rosalie released her new novel, I absolutely adored her first two novels. It took me awhile to get this book, to understand the characters and what was going on. But never once was I not captivated. I simply couldn't stop reading and it very nearly took over my life. Rosalie Ham has a way of writing that really gets under your skin. She is do very good at drawing you in. And she never gives you a rest. I wouldn't suggest any of her books unless you have some serious free time on your hands! 'There Should Be More Dancing' is a great read. The characters are perfectly dev It took me awhile to get this book, to understand the characters and what was going on. But never once was I not captivated. I simply couldn't stop reading and it very nearly took over my life. There should be more books by Rosalie Ham! Her first book, The Dressmaker, was definitely my favourite but after a slow start I enjoyed this one too. It's about the life of an elderly woman and her connection to her family and the community, often humorous, sometimes sad. Ham's characters have a wonderful quirkiness about them. This book is set in Brunswick and the local references are enough to make it worth reading. I loved The Dressmaker and was a little disappointed by this book. It was terrifying at times to realise the harsh reality of the manipulation and control children can have over elderly parents. I was constantly angered by the behaviour of the characters surrounding Margery, and Mrs Parsons story brought me to tears on several occasions. A thoroughly depressing read, a bit scattered, hard going but I'm glad I finished it because it wasn't a bad read. A comic tragedy about a sometimes-outlandishly kitschily Ocker family, and its unhappiness coming home to roost as the matriarch starts to lose her health. Scenes in a nursing home especially are vivid, tender and completely terrifying - I know Rosalie used to work in one. I wasn't sure I quite bought the uplifting notes of the ending, where closed and inarticulate characters suddenly became expressive and self-aware. One of those books that when I started reading couldn't put it down. Loved the structure and loved how the main character was portrayed. A very flawed character that was presented in a plausible way. I really like Rosalie Ham's writing and this is the second book of hers I have read. Will get the third one now. If I could give it 3.5 stars I would as it is better than the 3 star books I have read but not quite in my 4 star list. I did like it a lot though. The writer has great "voice" and the story made me laugh and even feel sad. It's good to read a yarn that is true to our age and lives in Australia or New Zealand. Excellent contemporary feel and good story. I loved this! Funny and sad and incredibley poignant, it is a wonderful snapshot of suburban Melbourne in the last 60 years. The main character aroused pity and concern and fondness while the supporting characters are by turns dislikebale, infuriating, and curious. Rosalie Ham does not rush her novels and are well worth the wait. what a great little story. I was quite surprised by how much I enjoyed this, and how much I enjoyed Marjery! I think we all live a little like her sometimes -blinkers on to what we don't want to know, and in that way she is completely relatable. I'm inspired to read The Dressmaker now, as it is miss Ham's better known book. Wonderful story of an elderly woman living in an ordinary street in Bursnwick (Melbourne)- especially loved the druggies demolishing the old house next door and building a fortified drug lab. Wryly humorous but makes one think about one's own end of life. A book about aging and the good and bad of having families. Marjory is tired of life but on her birthday her family gather round, emphasizing all the of things she likes and dislikes about them. It is funny, but close to the bone on many points. An excellent title for book groups. Rosalie Ham was born, and raised in Jerilderie, NSW, Australia. She completed her secondary education at St Margaret's School, Berwick in 1972. After travelling and working at a variety of jobs (including aged care) for most of her twenties, Rosalie completed a Bachelor of Education majoring in Drama and Literature (Deakin University, 1989), and achieved a Master of Arts, Creative Writing (RMIT, M Rosalie Ham was born, and raised in Jerilderie, NSW, Australia. She completed her secondary education at St Margaret's School, Berwick in 1972. After travelling and working at a variety of jobs (including aged care) for most of her twenties, Rosalie completed a Bachelor of Education majoring in Drama and Literature (Deakin University, 1989), and achieved a Master of Arts, Creative Writing (RMIT, Melbourne) in 2007. Rosalie lives in Brunswick, Melbourne, and when she is not writing, Rosalie teaches literature. Her novels have sold over 50,000 copies.